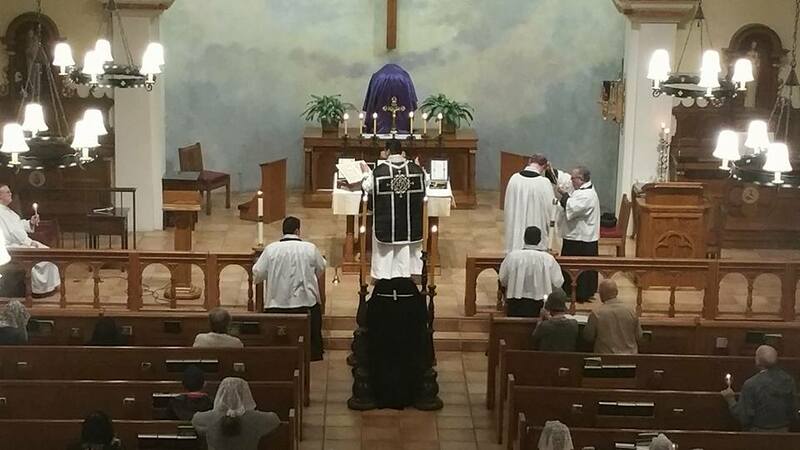 After spending most of the morning in Holy Mass at Holy Cross Cemetary yesterday, celebrated by Bishop Emeritus Robert Brom for All Souls Day, I had the distinct honor, all giving to our Lord, to attend All Souls Day Requiem Missa Cantata and a visit to the Campo Santo Cemetery, Old Town San Diego. I can say with my entire heart, our Lord wanted me here last night. Sunday I had tried to make it for Second Vespers and the entire area of Old Town San Diego was packed with people, so much so, it took me an hour just to drive through the town. There was no parking available as the people crowded the streets dressed in their Day of the Dead costumes. I had never attended anything like that before. Streets were closed down and blocked off and it was just a matter for me to get through and head back home. Last night, could have been the same, but the second I pulled behind Immaculate Conception Catholic Church, a woman got into her car and was leaving. Opening up a spot for me to attend. As I started walking up to the Church, people were still dressed in costumes and eating, drinking and loud music was playing. It was actually chaotic. I’m not one for crowded places so for me, it wasn’t something that draws my attention. As I walked up the steps a woman dressed in her death costume was standing in front of the entrance of the Church, shouting to her friends to take her picture. It was chaos on the exterior of this beautiful Church. I walked past her and entered. The inside was quiet and our Lords Tabernacle had been covered as they began to set up for the Latin Rite Requiem Holy Mass. I breathed a bit easier, genuflected and began to pray with our Lord. My soul became quiet and Holy Mass began. All in Latin, and as the celebration continues on, I was caught up into it. One of the most beautiful things that took place was a friend of mine from the Brothers of the Little Oratory, who was directing the schola, went up and pulled the bell rope to match the altar bells during the consecrations, doing this, announces to the world the sacrificial presence of Christ on the altar of his church. The entire city of Old Town San Diego was able to hear the presence of our Lord on His Altar. As this took place I was in complete joy. All the chaos outside and darkness knew our Lord was present. 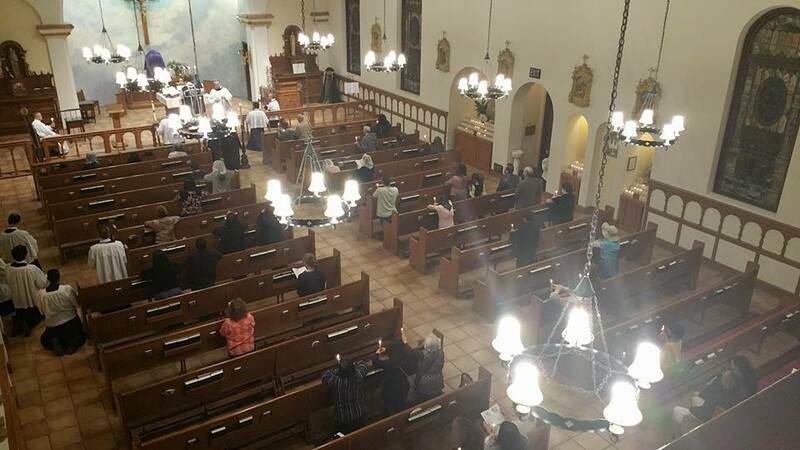 At the end of Holy Mass, we began to light our candles again and began a lighted processional to the first Old Adobe Chapel, a few blocks from Immaculate Conception. As we left the Church, I followed closely behind the Priest as the Brothers of the Little Oratory lead the way, singing. As we walked out into the streets, it was as if the entire world outside came to a screeching halt. We, in prayer and procession, entered into a place that was not expecting to see a Holy Procession. Taken by surprise, the world outside began to warm. I watched souls begin to pray with us, sing with us and follow us. As we walked down the packed streets of Old Town San Diego, it was as if we were parting the Red Sea. 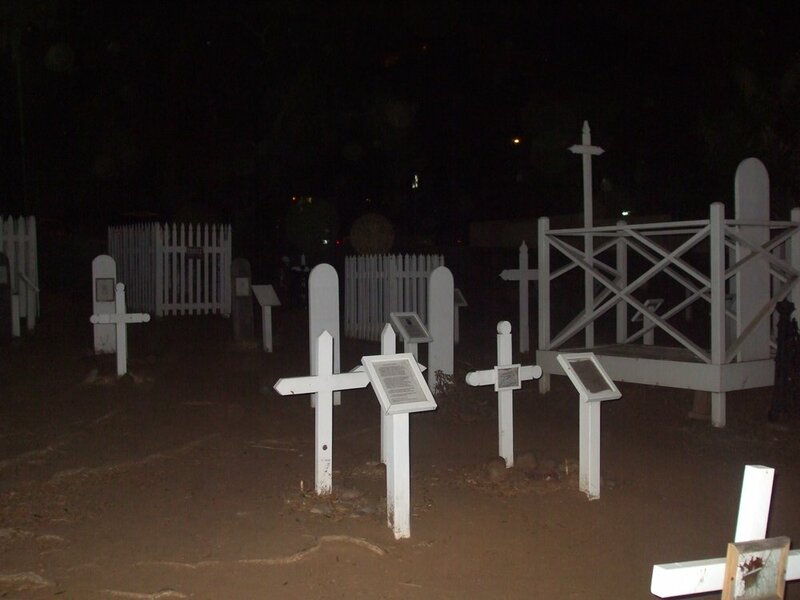 Swarms of souls moved out of the way without asking and began to make the sign of the cross, some take pictures and most of the souls smiled at the procession to the Old Adobe. 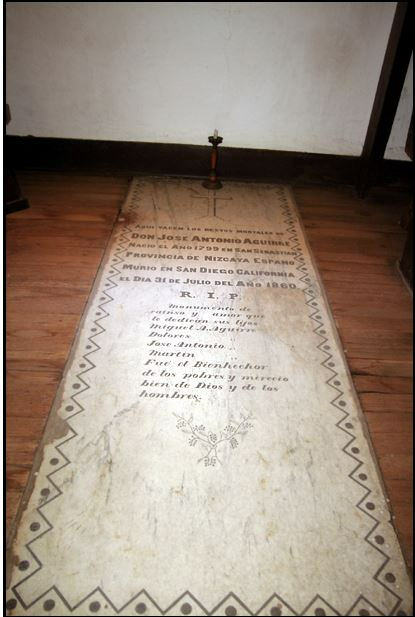 We entered and blessed the grave of José Aguirre and prayed again. 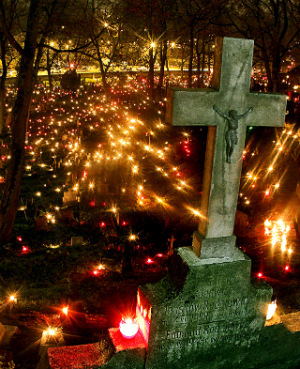 As we left, we began the beautiful procession, in candle light, song and prayer, again to Campo Santo Cemetery. The same parting took place and traffic was stopped as we crossed the street and entered into the Cemetery to bless the graves. There were two souls inside who were not so impressed as they had other ideas as one man began to tell the other that he had no clue this was going to take place, but the other man, much calmer, was able to assure the other it was right that we should be there. We simply continued on and passed them into this place. 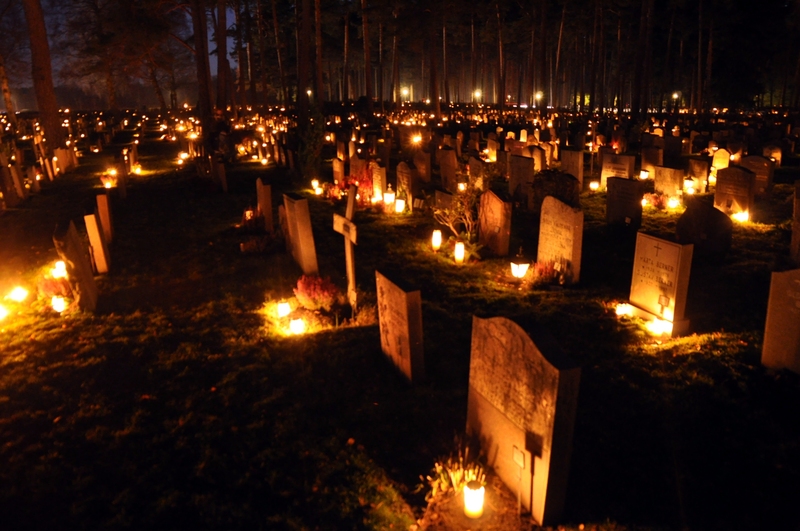 Our Lord won the conflict and quiet was achieved to begin the blessing of the graves. We prayed again for the souls buried there and without incident, processed out, chanting in the battle cry of our Holy Mother all the way back to Immaculate Conception Catholic Church. I had never seen so many souls taken in by an event as this before. It was so beautiful to see people stop and take notice that the dead that are buried in this pace, are not a simple tourist attractions and deserved prayer and respect. They, the precious dead, received both last night. Praise, glory and honor to our Lord. I was once asked if I would consider taking a “position” in the “Divine Office”. Unaware of what I was being asked, I was also told about the “Office of the Dead”. I chose the position in the “Divine Office”. I only have to show up 4 times a day for a 1/2 hour each time. But I must put my heart into the “job”. The pay is out of this world. I accepted the “position”. Little did I know it was in the “Office of the Dead” located in the “Divine Office”.